The new townhome community in Sayreville is offering a complimentary hardwood flooring upgrade on all contracts signed by December 22. Overlook at La Mer is offering a complimentary hardwood flooring upgrade on all contracts signed by December 22. “This community serves as a beautiful oasis for our residents. We pride ourselves in having a strong focus on attention to detail and quality craftsmanship,” said Jason Kaplan, President of Kaplan Companies. 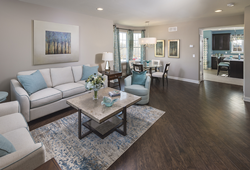 Kaplan Companies has kicked off its holiday sales event at Overlook at La Mer, its newest townhome community in Sayreville, New Jersey, by offering complimentary level one wood flooring on the main level of all new contracts signed by December 22, 2018. Buyers will have the choice of any level one three-quarter-inch oak plank wood flooring for the main level, which includes the dining room, living room, powder room, breakfast nook and kitchen. Please contact our Sales Office at 732-309-4682 for more details regarding this offer and to schedule a personal tour of the fully decorated Monaco model. Onsite amenities include a 4,844 sq. ft. resident clubhouse with a lounge, outdoor pool and tot lots, as well as tennis, volleyball and basketball courts. “Residents will be able to soak up the sun and enjoy the fresh air in one of our sparkling pools, including a kiddie pool specifically made for younger children, as well as utilize outdoor living space,” Kaplan added. Traveling is easy from this central New Jersey location, with the Garden State Parkway only minutes away and Routes 9 and 35 nearby. Enjoy the convenience of a nearby Park-and-Ride with access into Manhattan. NJ Transit® South Amboy train station is just three miles away. Overlook at La Mer is located at 2402 Pysno Court, Parlin, NJ 08859. The Sales Office is open Friday through Tuesday from 10am to 6pm and closed on Wednesday and Thursday. Townhomes are priced from the $300s. To learn more, visit OverlookAtLaMer.com or call 732-253-8560. Kaplan Companies began in 1952 with a dream to create beautiful neighborhoods built for lasting value. Now, more than four decades and 25,000 homes later, the Kaplan name has become synonymous with top-quality homes and long-term value in today’s residential market. Few companies in the industry can match the level of service, integrity and professionalism that Kaplan Companies provides. Today, Kaplan Companies is dedicated to making the dream of home ownership a reality for you and your family. To learn more, visit ThinkKaplan.com.